This one is sort of tough for me as on the surface there is absolutely nothing to dislike about this album. It is what is known in many circles as ‘a classic’. Having said that there are elements of it that keep it rooted. It’s very genre specific – being a ‘plastic soul’ album, as Bowie himself described it (I believe). I’ve lost count over the years how many times I’ve heard the title track, especially the radio edited version. Too many in all honesty. It’s a song I tire of very quickly when it starts as I am just ssssoooo over familiar with it. Of course I love it, but I also hate it because I know it FAR too well – if you know what I mean? Fame is similar in that I know it sssooo well, but I still get new things from that as I still probably haven’t heard it quite as much as the title track. I think it stands the test of time a little more as well. 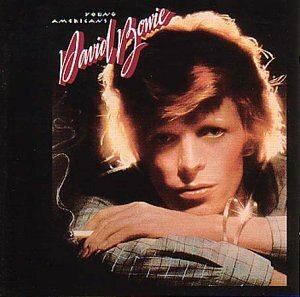 I had quite a love affair with this album during the early days of my Bowie fandom. It would be on regular rotation. But in recent years that love has waned a little and now I find it more of a ‘mood’ album as it now feels so genre-defined. I have a great affinity for all the other tracks, a tiny bit less for Across The Universe than the rest of them but only because of the sacrilege of doing a Beatles cover (even though it *IS* with Lennon himself providing the backing vocals). I again have the Rykodisc version with the three bonus tracks. Of those I really like ‘Who Can I Be Now?’, but not so much the other two, especially John, I’m Only Dancing (Again) – a particular ‘crime against music’! My favourite track off the album proper is ‘Can You Hear Me?’. Having said all that, it is the first Bowie album I have come to on my reverse order list that I thoroughly enjoyed listening to and can appreciate the masterpiece that it is.